The cat flea is very small, about 2 to 3 mm long. Its colour is dark reddish-brown to black. The body is pear shaped when viewed from it side, and flat when viewed from above. The flea’s back legs are much longer than the front four legs which allows the flea to jump up to 6 inches high. The most common type of flea on pets is the Cat Flea. It can be found on many types of pets including cats, dogs, rodents, raccoons and other animals. It is a particular problem in coastal and lower mainland areas of B.C. 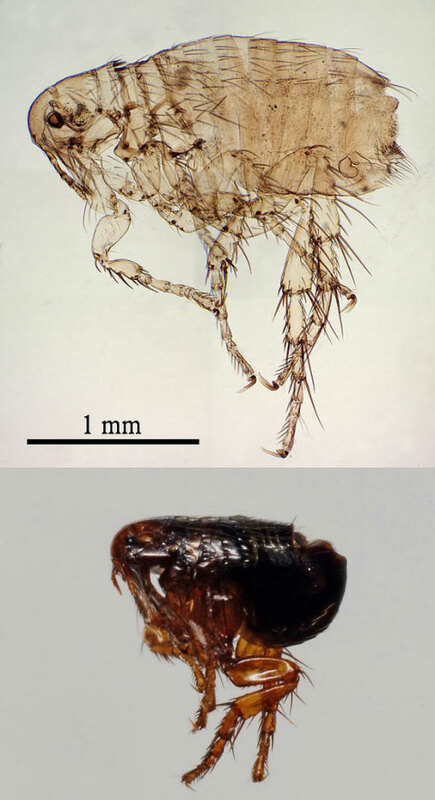 The adult flea will feed off of blood from its host, usually animals but sometimes people as the infestation of fleas increases. The flea will be present anywhere the animals spends time, but most often will stay with the animal. A female adult flea will lay 4 to 8 eggs at a time on the host animal or its bedding, and the eggs will fall from the animal onto the floor or anywhere the animal happens to be at the time. The eggs will hatch in 10 days into larvae and live in cracks and crevices of baseboards, furniture and carpets. The larvae feed off of adult flea excrement which contains large amounts of dried blood. After 5 to 24 days the larvae spins a cocoon and mutates into a pupae. The pupae will develop into an adult flea within 5 to 14 days, at which time it may emerge. The flea may also stay in its cocoon for several months while being protected from low humidity and pesticides. Once emerged, the flea will seek out hosts from which to feed. Controlling fleas on pets is the most important factor to prevent flea infestations in the home. Pet owners should regularly check pets for fleas and take quick action to treat the animal if fleas are spotted. Owners should consult a veterinary clinic for the best flea control methods for their pets. Another prevention method is restricting wild and stray animals, such as raccoons, rodents, and stray pets, from the home. Restrict all animals from accessing hard to reach places such as under porches and crawlspaces. Dense, moist and shady areas around pet kennels should be mowed or clipped to remove the habitat in which fleas thrive. Remove or clean up wood piles, junk, or other harborages in which rat, mice, squirrels and other flea-carrying animals may live. A pest professional can consult you on the best control method including chemical and non-chemical options. Contact our professional team today. Victoria Pest Control provides a wide range of services to the Greater Victoria Area, including a mix of residential, commercial, institutional and marine customers. For over 20 years we have been using Integrated Pest Management methods to help you rid your home or business of rodents, ants, bedbugs and a whole host of other unwanted visitors.